I was looking for other paipo riders in the Huntington Beach Ca. aera. The surf has been realy prety good. Huntington Beach and Newport Beach (and I suppose Costa Mesa) used to be the center of paipo/bellyboarding during the 1960s. There should be at least a couple of folks... or did they all leave to points south and north? Now a days it appears one has to travel either north of the LA County Line or south of the Orange County Line. The Costa Mesa mafia hunts down non-standard riders...dare to say "yes" to adventure! Although to be fair, in south OC San Clemente/Dana Point and Laguna have nooks and crannies of pronated riders. Scooby rode the Huntington Cliffs, but we haven't heard from him for a while. Thanks for the replay.I thought I be the only happy hippie in HB. Tower 9 is my cloest break. I have been trying to work on big turns off the top I'm not having much luck any hints. My paipo may be a little stiff my brother and I are talking about how to build in some flex. any advice well help on surfing or board shape 50/50 rail or 60/40. Josh, what kind of board are you riding? Please describe in some detail and what boards (belly/paipo/body) that you have ridden in the past. 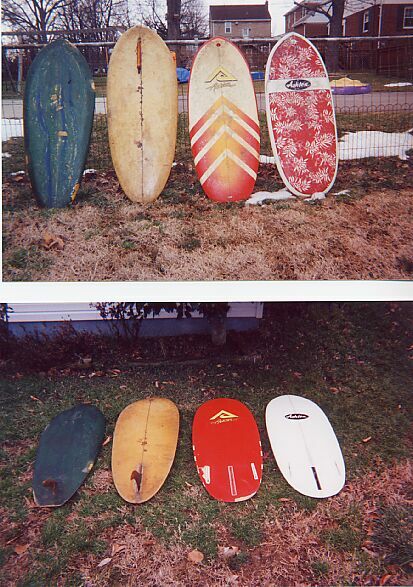 Length, width, rocker, fin set-up and sizes, etc. That will help us provide feedback. Board flex will definitely help you on big turns. What kind of board; solid wood or plywood? My most maneuverable plywood paipo has roughly 70/30 rails. That board is 1/2" thick reinforced with marine epoxy - still pretty flexible. When I passed through your area this past fall, I met a bodyboarder at Wedge who takes off /rides old school paipo style. Like me, he started surfing in the paipo/bodyboard transition era. Don't remember his name, but he had a white Science / Mike Stewart board. Closest thing I know of to any other paipo riders in your area. About 5 years ago I was running my dogs at the HB dog beach and I saw a Hawaiian looking guy just getting out of the water carrying an HPD. I should be down in Huntington in about a month. If there's any surf left I'll look you up? Josh - I have a 44" board similar to yours in nose & rail shape, except mine is 3/4" thick ply and the tail is squared off at 14.5" wide. I've had the best luck with paipos around this length or a bit shorter, and ones with wider tails for best maneuverability. Some flex helps too. Since your board is solid wood, you could try planing it down to get more flex. Another consideration is what you mean by big turns off the top. Coming from a standup background I don't surf as vertical (e.g re-entries) on a paipo. There is a link on the paipo forum somewhere to a French bodyboard surfer riding small Pipe doing tricks etc. I tend to ride a paipo, planing high in the wave, bottom turning or cutting back, rather than vertically if that makes sense. Flex and bouyancy will certainly affect the ride - it will be interesting to see if this enhances the type of turns you are wanting to do. The type of wave you surf will also dictate if there is a lip you can hit and where he most power is in the wave you are surfing. On another note, if you are around Huntington, Rod and I have been trying to find out who shaped some of the paipo/owned the businesses around that area in late 60s-early 70s. If you know a bit about that era or someone who might, feel free to pm. I ride a 50" board, albeit foam/fiberglass. My earliest board was a tear drop shape similar to the one you describe, Josh. It was thin and great for down the line speed, holding into the wave and even for doing some "tricks" such as El Rollos. It turned ok but not as well as my current boards which have much wider tails. Compare the green board to the Checkered RPM below. Although Checkered RPM's rails are rather hard it also has a wide tail which helps to release for turns (and also overall speed). The green board had a 7" center fin and the RPM uses a 4 to 5 inch center fin and two small side bites (2"). Back to your question on turning off the top of a wave -- a wider tail and softer, more squarish rails would probably help given that the thickness of your board/rails are already small and tend to bite into the side of the wave.